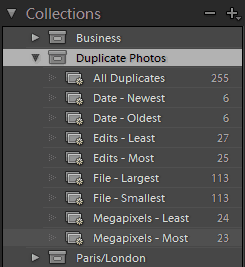 After you use Adobe Lightroom for a while, you may discover that you have some duplicate photos in your library. This can happen for a number of reasons. Perhaps you store your images across multiple drives, or you’ve found a few SD cards and imported the images “just in case” they weren’t in your catalog already. Lightroom does its best to try to detect duplicates on import, but inevitably you’ll have some in your collection. How do you find them to get rid of them? There are plenty of utilities to find duplicate files (DoubleKiller and Easy Duplicate Finder, for example) but they are not photo-specific, may not be able to find resized versions of the same photo, and require you to work outside Lightroom. Personally I want to do everything I can in Lightroom. 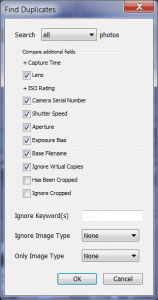 If you suspect you have duplicates from a particular day, you can use Lightroom’s metadata filter to only show that day’s photos and skim through the photos manually. It’s not pretty but it works. 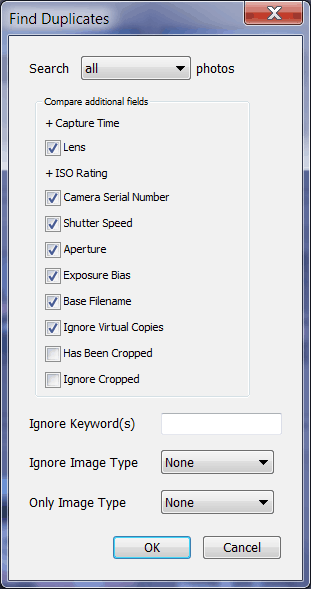 There’s a great plugin, Find Duplicates (http://www.lightroom-plugins.com/DupesIndex.php) that does all the hard work for you. Simply download and run the setup file, and it’s ready for use in Lightroom under Library / Plug-in Extras. I let it run against my library of almost 70,000 photos with the default options, and it took 145 seconds to find 255 matches. The plugin creates several smart collections of your duplicates, grouping them by various attributes. Once it finds your duplicates, you have to review the collection and decide what to do with the duplicates. In many cases they are indeed duplicates, but in some cases there are valid reasons to keep the duplicate. For example, I have a few TIF copies of photos that contain some edits outside of Lightroom that I’d like to keep. Since these are smart collections, you cannot delete duplicate photos directly. What you can do is mark them in some way (such as flagging the undesired copy as “rejected”) and then filter your library for the marked photos and delete them then. Once you remove the obvious duplicates, you may be left with some that register as duplicates but you don’t want them to. You can set the metadata on these images so the plugin will ignore them in the future. Select the image(s) that you want to omit from future searches, go to the Metadata panel and select “All Plug-in Metadata”. You will see an entry under Find Duplicates 2 entitled Duplicate Search. The manual says this is normally set to “Yes” and you should set it to “No”, but in my case they are all set to “No” and I have to set it to “Yes”. I’ve reported this to the developers. The license for this plugin costs £8.50 (British pounds) or a bit over $14 US.